Wide range of padded post protectors and safety mats. Covering any exposed posts, corners or beams. 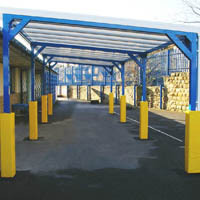 Canopies, fencing, building corners, racking, pillars..
Unsure of what you need? We are here to help and advise you. Please call us on 01536 446393 (local call rate from a UK landline) or use our quick contact form on the right and we will get right back to you. Here at The Canopy Shop we supply a full range of padded post protectors and safety mats. Produced from industrial strength vinyl, with 50mm high impact foam as standard, these padded post protectors are perfect for covering any exposed posts, corners or beams. 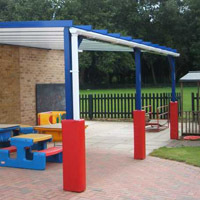 Our range of safety padding is ideal for canopy posts, schools play areas, rugby posts, floodlights and a vast range of commercial and industrial applications. These post protectors can be made to fit square, rectangular or round posts so no matter what you need we can make a post protector to fit perfectly. We have provided many safety pads to protect cars in showrooms, dealerships and car parks; as well as custom made workplace safety padding for construction sites and factories. The safety mats are perfect for covering walls and fences, and are ideal for gyms, classrooms and outdoor football or sports pitches with wire fencing. Manufactured here in the UK, our post protectors and safety mats are available in a range of standard sizes but can easily be custom made to your specifications. The post protectors and safety pads are easy to fit as they simply velcro on and off, or can be produced with straps or eyelets depending on your requirements. The Canopy shop safety padding is available in 16 standard colours. You can choose to have a range of coloured pads or keep them all the same at no extra cost. The range allows you to brighten up areas with the bolder primary shades or chose more subtle colours like navy or grey to blend in more. We have a full printing service at our disposal allowing us print simple images and wording or full digital solutions. Whether corporate branding, school logos or sponsorship, we can help you to achieve the look you need. Post protectors colours include navy, maroon, bottle green, light grey, brown, green, bright purple, amber, pink, bright orange, yellow, red, light blue, mid blue, black and white. Please click on the appropriate tab on this page for more detailed specification information, for pricing and for additional photographs. 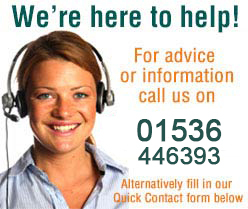 For help and advice please call us on 0345 2417182 (local call rate from a UK landline) or contact us and we will get back to you shortly. Durable pads, Strong, wipe clean covers. Covers are made from rip-stop 610gsm PVC. 50mm thick, high quality, high density and impact absorbing foam. Foam is flame retardant, CFC free and tested to Crib 5 standards. Flame retardant PVC is fire tested to BS5867-2 standards. Heavy duty Industrial Velcro fastens down the back. Manufactured here in the UK. Supported by a full, reasonably priced printing service.